Obesity is a life-long progressive, life threatening condition marked by the excess accumulation of body fat, which can significantly reduce life expectancy. When weight reaches extreme levels, it is called MORBID OBESITY and is a chronic condition with numerous medical, psychological and social consequences. Finding out if you are obese is simple; you calculate your Body Mass Index or BMI. Obesity is also defined by waist size - over 90 cm in males and over 80 cm in females. What is Bariatric (Obesity) Surgery ? Bariatric (Obesity) surgery, or weight loss surgery, includes a variety of procedures performed on people who are obese. Weight loss is achieved by reducing the size of the stomach through removal of a portion of the stomach (sleeve gastrectomy) or by resecting and re-routing the small intestines to a small stomach pouch (gastric bypass surgery). 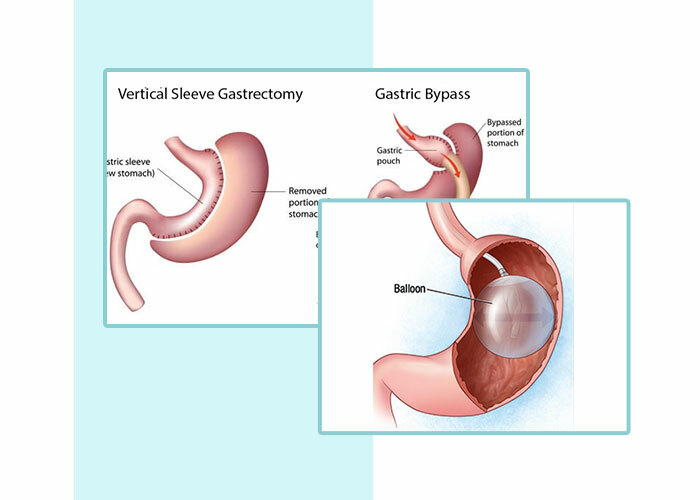 The Vertical Sleeve Gastrectomy (VSG) generates weight losssolely through gastric restriction (reduced stomach volume).In VSG approximately 2/3rd of the stomach is stapled offalong its greater curvature, leaving behind 1/3rd stomachalong lesser curvature, which is roughly the size and shape ofa Banana or Sleeve. This operation does not involve any “rerouting” orreconnecting of the intestines. Hence it is technically asimpler operation than the gastric bypass. A study shows that after 10 to 14 years, patients have maintained 60 % of excess body weight loss. A study of 500 patients showed that 96 % of physical problems were improved and resolved in some cases which mainly includes back pain, sleep apnea, high blood pressure, type-II diabetes and depression. In most cases, patients report an early sense of fullness even by taking little food so that there will be no desire to take more food. An air balloon is implanted through the endoscopic route in only around30 minutes without the need to hospitalise the patient. This procedure of implanting is nonsurgical and minimally invasive thus reducing post implantation nausea, vomiting and the feeling of pain. How it works to help you lose weight ? Intragastric Air Balloon is filled inside the stomach to create short term and rapid weight loss. It promotes a sensation of having eaten too much after a little meal and thus loses weight at a fast rate. This balloon is temporary and has to be extracted after six months. A surgical solution is an important innovation for patients suffering from Obesity and Diabetes. Bariatric Surgeons from around the world were surprised to know that within 24 to 48 hours after surgery, type-II diabetes of patients was cured complete.